Soft Cover 8"X12", 40 pages, with black and white photos; (6 pages of color photos). The 40-page book contains numerous photographs from the Marines scrapbook and recent images taken by the author on his visits with the Marine units in the field. 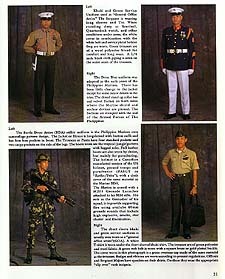 Excerpts from CITEMAR6, the Marines official publication have been organized chronologically with captioned photographs to set the timeline of the Marines' history. Interviews with several Marine Commandants were interspersed to give a personal insight to the events as they experienced them. 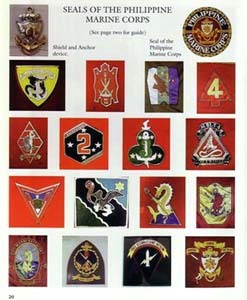 The six center pages are printed in color illustrating the seals of the Marine Battalions and the different Marine uniforms. The author Franz Tinio-Lopez set about to update his compilation of photographs of the Marines in action. His friends in the Marines who had been corporals and Lieutenants in the Marine platoons were now Senior Non-Commission Officers and Field Grade Officers in command of Marine Battalions. They constantly challenged him to focus on the Marines ethos and esprit-de-corps as their drive to serve the Filipino People. AVA, PoBox 21104, Oxnard, CA, 93034, USA. Softcover 8"X12", 40 pages, with black and white photos; (6 pages of color photos). 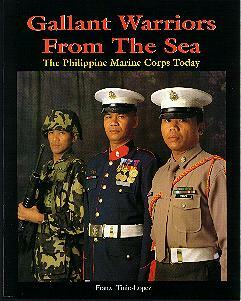 In Manila, copies are also available at the Armed Forces Museum gift shop, Camp Aguinaldo, Quezon City.